So, we would be talking about using a Hydrosphere, with the existing or somewhat upgraded atmosphere for a while. At first local resources would be everything as far as water is concerned, but over a long period of time, even polar deposits, to be utilized. So, calculations would be required. During the time period when polar deposits could not be utilized, because it was beyond the capability of the so called "Civilization" established on Mars, there would be lower latitude water which would be fluidized into a hydrosphere, and some that would be held in reserve as "Make up water", to serve the time period until polar reserves could be utilized by a much more capable "Civilization". Utilizing energy several times is preferable. For instance if you had habitats in at the bottom of such a hydrosphere, energy in the form of electricity, and perhaps fuels and Oxygen, could be used inside of habitats/factories at the bottoms of such hydrospheres. The waste heat to be exported into the hydrosphere, in order to keep it liquid, and more warm. Canals and rivers are a least costly means of transport on Earth, I suggest that the potential for using that scheme could be also used on Mars. Per Peter Zeihan, the greater Mississippi water ways, and the east coast intercostal waterway, (And he does not mention the great lakes/St. Laurence). Waterways are a big part of what makes North America capitol rich. The efficiency of it. So, the key would be to establish cities under a hydrosphere, and link them by canals. All of the hydrospheres and canals would need to have a protective layer of ice, and above that a protective layer of "Greenhouse". That greenhouse utilizing the photons of types we would not want to enter the waters to make electricity. (U.V. in particular) and as much as is possible allowing photons friendly to life to enter the waters. Perhaps just the photons that green plants use. It's hard to have this much fun otherwise. Chemosynthesis would be quite useful in this situation, probably more important than photosynthesis. Still, you begin a hydrosphere, terraforming, and achieve it far sooner than you achieve a atmospheric life sustaining terraforming. At first, your under ice canals are local, but you link them up over time, and eventually even link to the total polar deposits. By that time you have a sustainable loop, since any water losses you have from your low latitude "Civilization" cities, is sent to the polar areas, and if you have methods to recover that water by melting it into canals, then you have a very long term, return method. And let me emphasize that I consider "civilization" to only be organized cruelty. "Civilizations" are criminal entities. But decency is far better. Not the fruit of the knowledge of good and evil, but love. Sorry if that makes anybody uncomfortable. Earth Oceans explored but not colonized plus Biosphere 2 equals a test here on earth for what we ca do on mars. An underwater habitat has to meet the needs of human physiology and provide suitable environmental conditions, and the one which is most critical is breathing air of suitable quality. Others concern the physical environment (pressure, temperature, light, humidity), the chemical environment (drinking water, food, waste products, toxins) and the biological environment (hazardous sea creatures, microorganisms, marine fungi). Much of the science covering underwater habitats and their technology designed to meet human requirements is shared with diving, diving bells, submersible vehicles and submarines, and spacecraft. And yet how hilarious, if it were true in the future? Any such water craft will need some invented methods. They would be more like submarines under ice on Earth. But some differences of circumstances would exist. For instance if the low parts of the ~Northern hemisphere were eventually fluidized, the danger of a submarine sinking to dangerous high pressures would be low. For the most part it is unlikely that water would be more than 100 to 200 feet (Or less). Underwater vehicles on Mars, might indicate submarines, or wheeled vehicles that actually travel on roads under water. On Earth this would be always considered absurd, because we have better options, such as traveling in the atmosphere. Of course on Mars hyperloop might offer some very nice options in it's greater vacuum. We still have to find out when and how that is a best case. But with or without water transportation, being able to have a hydrocycle on Mars should be considered a vast accomplishment. That is if your water losses from the equator from human methods of habitation can be compensated for by using canals to bring make-up water from the poles, then you are a long way near getting the atmosphere terraformed. The water type habitat may be able to generate Methane and other greenhouse gasses, and perhaps even Oxygen. And if there are Clathrates in the Martian subsurface, where water then is caused to exist, at temperatures between -10 (Salt water) to 20 DegC (Whatever water), we can expect them to disintegrate to form atmospheric gasses. My own suspicion is that while there has been a high rate of loss of Hydrogen from Mars over time, that other atmospheric gasses have more strongly disappeared from the Martian atmosphere by going underground into Clathrates. I could be wrong. So what. So, I think I have a way to use energy 3 times in waterways on Mars. 1) Electricity from solar cells on greenhouses, that allow visible wavelengths that we would want to get into the water. The electricity would be generated by U.V., Shorter Infrared, and perhaps visible wavelengths that organisms that use photosynthesis do not use. 2) Waste heat to keep the waterways liquid, the waste heat being in storage in the water until it is either to be shed with a heat exchanger, or actually generate electricity in the shedding of that heat. 3) Possibly in fact generating electricity by the suggestion in #2, where a condensation process of perhaps Ammonia or something else with necessary characteristic vapor pressure for shunting heat out of the waterway and to the Martian sky. I have thought further about ice covered waterways, with ~Ambient Martian air pressure greenhouses. a) I have realized that for both fresh and salt water, there are stratification methods to conserve waste heat until it is desired to shed it. b) The ice covering is also a insulator of large significance. c) The greenhouse structure with a proposed interior air pressure ~Martian Ambient, (+/- ? 5.5 mb) will function to some degree like a thermos bottle. ~5.5 mb is not a vacuum such as you might put into a thermos bottle, but it should be pretty good. The long infrared photons emitted from the surface of the ice at a guessed temperature -20 degC should bounce off of the greenhouse interior and not very willingly go through. (Not sure, but it is a guess). So how do we shed the excess heat at will? Make the greenhouse itself a heat exchanger. To the degree possible make the supporting members also be or be in association with heat exchanger tubes. Then even the panes of glass will be part of the heat exchanger. So then the ~Ambient Martian air pressure greenhouse would fill an additional function. 1) Solar Panels. (Utilizing photons you do not want to go into the water to produce electricity, also consuming the undesirable photons). 3) A thermal shedding heat exchanger. I could add some other stuff, but this is already quite a lot for now. Oh alright I will add that you can build a dome under the water to surround the habitats you live in. It can be water filled or perhaps even air filled. However for an air filled dome you are going to require some greater structural strengths. Anyway if you do make enclosures, then this is another way to conserve heat until you want to dump it to generate electricity, if that is your intention. Yes, there are some other things, but good enough for now. The heat exchanger for the water and for the greenhouse can be the flow of co2 through to the processing plant just use a bypass to shunt the flow around either or both when no cooling is required. The water also needs airation to keep it oxygenated and circulating to allow life to live within it. If the greenhouse is hydroponic then a mesh floor is idea and makes for the complete growing cycle to be contained within a single structure. The greenhouse "hydroponic" reveals that you understood nothing of what I intended to communicate to you. Why that is true is so much a disappointment I cannot say. But if my suspicions are true, you will not get what I say to you without alterations. What a pity. They are so stupid. So the definition for your greenhouse is only a pond in a bowl.... and not a true greenhouse for farming food grown in soil or hydroponic.. The water could be less than 5 feet deep under the mesh to allow for the aqua farming to be done. The UV solar cells that would form the roof would protect the crew in shirt sleeves while regular multi layer cells would be on the surface to provide more power. I need to apologize. I am sorry. That was rude of me, and unfair. And it was unthinking, and not at all polite. Yes, however, a pond in a selectively photon passing enclosure. However, yes, there is a potential for air or water enclosures inside the ice covered pond to grow plants. Either aquatic or atmospheric. And yes hydroponic. I believe that many plants require only 10% of the light they receive. The greenhouse and ice layer and water and then the transparent enclosure inside the "Pond" would attenuate the Martian sunlight 43% of Earths to start with? So, it might be possible that there would be enough "Natural" sunlight. However most likely the enclosures will be better off as near to the light source as possible not on the bottom of the pond. For air plants very tall diving bells with the plants being in racks or pans near the top of the diving bell being an option. If a fresh water diving bell were 33 feet tall, then the air pressure inside would be ~1/3 bar. If a brine water diving bell were 33 feet tall, then the air pressure inside would be >~1/3 bar. Another trick would be pressurized canisters. You could have a diving bell on the bottom of the "Pond" say at 100 feet ~1 bar N2/O2 pressure. You would bring the canisters into the diving bell and then plant these terrariums, and then seal it. You could extract some of the air as the canister were moved to fasteners just under the ice. Perhaps dropping the pressure to as low as 70 mb. This would be done so that the canisters would not have to endure a almost 1 bar differential pressure. However if you wanted to make your canisters strong enough, you could keep their interiors at ~1 bar. A extra feature you could add to a canister or transparent greenhouse diving bell would be a surround mirror. That would be to compensate for the attenuation of sunlight that I spoke of. So, with that your plants could perhaps have ~Earth equivalent sunlight intensity. The main problem with sealed terrariums, is then methods to weed and feed, and so on with plants are a problem, unless you take the canister downstairs periodically to the pond floor diving bell at 1 bar. An alternative would be robots inside the terrariums, that humans could operate remotely. That would not be impossible. Maybe a mass produced rather small robot. And again, apologize for my unthinking rudeness. I just thought of another method to be added to #35 post (The last one). I have specified greenhouses over the ice that are selectively transmissive of photons into the ice and water environment, and also serve as a vapor barrier, and also serve as radiators. The environment inside of these should be relatively friendly to regular types of transparent films. Therefore if you went to the trouble of inventing a perhaps circular portal in the ice, perhaps the size of a person, you could join a 33 foot pipe below it, and inside the glass greenhouse have a pressurized bubble. The portal ring that pokes through the ice will have to be insulating so as not to melt or evaporate the ice, and of course strong enough for the pipe below and the bubble above to attach to. The pressurized bubble could be of more ordinary types of plastic films, since the interior of the tempered glass greenhouse would be friendly to plastics that do not have fluorine in their structure. The bubble would have to be on a platform so that its warm interior would not vaporize the surface of the ice. With a 33 foot vertical pipe filled with air the interior air pressure of the bubble could be about 333 mb. A human could then climb a ladder up the pipe into the bubble to plant/groom/harvest the crops. Means of protection if the bubble starts to leak would be to get the heck down the pipe asap, for other people to help you then, and perhaps for you to have an emergency pressure suit on. A minimal pressure suit with an ability to keep you alive for a few minutes until you got down to the diving bell at the bottom of the "Pond". So there could be oodles of these bubble greenhouses all along your canals/ponds. I think that could work out nicely. A sort of mass produced modular design. And all greenhouses lead into the canals. No airlocks as such. I am sure that this is a good start, but more improvements will emerge. For this design, however the bubble may need heating at night. It would not be exposed directly to the Martian night as it would have the glass greenhouse above it, hydrophonics might actually be rather compatible. Circulate warm water into the bubble at night. 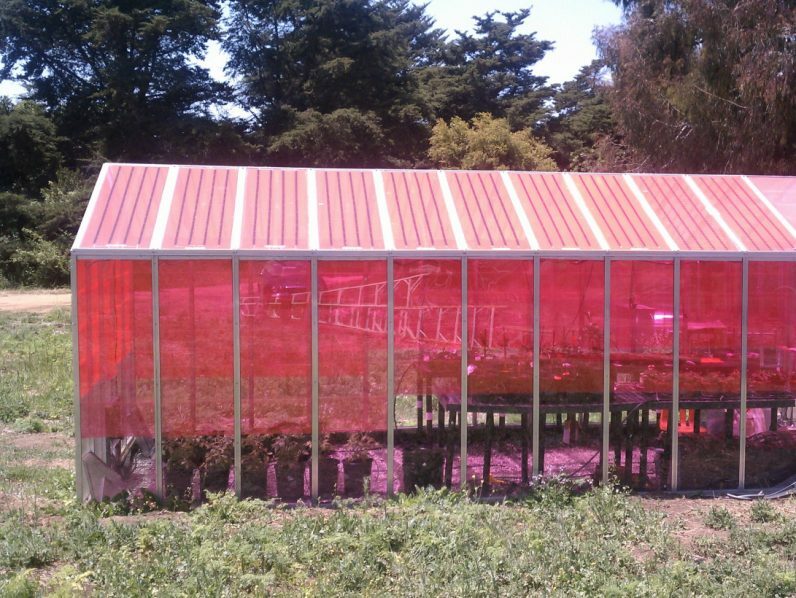 Another problem that could be true is that the heat from the plastic bubble greenhouse could evaporate the ice, due to infrared radiation from it. The platform the bubble rests on will need to be sufficiently insulated to avoid that. Still, a method that works seems like it would be in reach. Alright, I got stirred up and I am not proud of it. However, now I think I can improve on what was already posted. Originally I visualized an A-Frame "Greenhouse" doing all the functions in the previous posts. Using RobertDyck's recommended tempered glass. Now I want to alter that two different shapes. 1) Water tower type. This would be a Geodesic dome on a pipe extending deep (33 feet) into the body of water. Looking like a lolly pop, but with much of the stem under ice/water. A frame of durable materials to fix plates of glass to where appropriate to let sunlight in. Metal plates elsewhere. Perhaps no attempt to make that airtight. Inside of that frame, a balloon of a more common plastic, as we expect the glass and metal plates to protect the interior from the worst of the U.V. hopefully from all of it. No attempt to use Ammonia tubes to shed waste heat from the body of water. It would be too dangerous and hard for humans to repair them if they ruptured/corroded. However the bottom half of the dome divided from the top part by metal grating for instance. The bottom half largely filled with water, except for the person sized pipe that allows entrance and egress of humans. In order for the dome to not freeze at night more water circulated through that bottom half from the body of water. At least preventing frost in the upper half of the dome. This device will shed heat by water circulation. Also to satisfy Spacenut, vegetables could be grown in the upper half of the dome. Further....Most likely instead of only allowing the light wavelengths that plants need in, the wavelengths that humans can see would be let in. That way human psychology can be nourished by the fact that they will be in apparently normal sunlight and that they are surrounded by plants. It should be a good experience for them. Add some methods for them to look outside as well, I think. This device may or may not use special solar cells, to harvest UV and Infrared. Alternately it can use the protective coating that NASA has that RobertDyck has mentioned. Here again durability may be the deciding factor. Humans having to service greenhouse surfaces at high elevations is something to try to avoid. 2) Flat type. Just that. A frame that is flat, that you place panes of glass onto. Very little or no internal pressurization. Still however, if that glass is equipped to harvest any possible photons except those that organisms that use photosynthesis by the methods that are apparently being developed, then why not also put a glaze of common plastic under the frame, and therefore on top of the ice? In such a manner that you could occasionally jack the frame up and replace that plastic glaze. In this case I do recommend that the frame also be tubing, and that a fluid with a suitable vapor pressure be circulated through the frame to condense a vapor of some type, perhaps Ammonia. This then being a condenser for a power generating system which helps to keep the body of water sufficiently cool that it will not be destroyed by excessive heat. Where will all of these materials come from? Well that is going to be a problem in any case whatever method you use. Naked on the surface of Mars doesn't make you last very long. You need protective materials and methods. As I see it for the issue of food, the items that RobertDyck and Spacenut wish to produce will almost be the most expensive. Terrestrial vegetables. More expensive might be Mammal and Poultry meat. We certainly want some vegetables. We may or may not choose to make the effort for Poultry and Mammals. I suppose that the rich will. Aquatic multicellular organisms would be the next level down. Fish, shellfish, and perhaps some aquatic seaweeds or pond plants. Probably less expensive than vegetables, poultry, and mammals. And the next level down would be "Goop Stuff". 1) At the top Mammal Meat, very expensive. *Duckweed and plants like that fall in between #3 and #4. Lots of protein. Could be grown in any of the photo methods mentioned in this post or some previous posts. 4) Maybe somehow aquatic vegetables, done most likely by canister methods under the ice of a body of water. Spirulina fits into this category, even though it is "Goop". 5) Fish and the like. Fish and the like could be grown both by them eating what grows from the light entering the ice covered lake, or by human induced chemosynthesis. Prices getting more reasonable I should hope. 6) Chemosynthetic Goop. Well could be direct human food or for livestock. For amusement and to befuddle vegans I will attempt to propose a harebrained further idea. (I am quite capable). Medicinal use of Bladderwort: The whole plant is mildly astringent, diuretic and vulnerary.It is used as a poultice on wounds. Habitat of the herb: Ponds, lakes and ditches, usually in relatively deep water. Edible parts of Bladderwort: Root. No more details are given, but the root can be up to 1 metre long though it is rather thin. Another report says that this is a floating aquatic plant with submerged root-like capillary branches. Leaves. No more details are given. The juice of the plant is drunk for its rich mineral content. Propagation of the herb: Seed - we have no information for this species but suggest sowing the seed as soon as it is ripe on the surface of a pot of acid compost that is immersed in water. Division should be possible in the growing season. Cultivation of Bladderwort: Ponds, lakes and ditches, usually in relatively deep water. Can a vegan consume or use a plant that eats animals? (Fairy shrimp and microorganism). The Daphnia are animals for sure. I am not sure that Bladderwort can actually get energy from what it eats. It does get nutrients. Domestication of Bladderwort. I think that this is a good target. It is at least partially eatable. It floats, and does not therefor need soil perhaps. Genetic modifications, (Frankenfood), well if it cannot extract energy from the plankton it eats, try to make it capable. Also try to make the whole plant eatable. I'm done, the bladderwort thing was just a bit of fun. Messing with Vegans mostly. I have nothing against them, but some strange questions emerged. I could not resist. I could be way off on this but By my best guestimate is the area required for man based on the biosphere 2 ( 3.17 acres or 12,700 m2) experiment is closer to 6 acres due to the 43% of the suns rays that get to the surface and may be closer to 10 for a crew of 6 to 12 on mars to enclose for a natural eco system due to energy loss to mars from contact through the materials. As an experimental ecological facility it allowed the study and manipulation of a mini biospheric system without harming Earth's biosphere. Its seven biome areas were a 1,900 square meter rainforest, an 850 square meter ocean with a coral reef, a 450 square meter mangrove wetlands, a 1,300 square meter savannah grassland, a 1,400 square meter fog desert, and two anthropogenic biomes: a 2,500 square meter agricultural system and a human habitat with living spaces, laboratories and workshops. Below ground was an extensive part of the technical infrastructure. I do not think we need all the biomes for man to be successful. "In 2003, the Biosphere was typically operating at about 13 million kilowatt hours (per year). This last year, 2009, we used about 4.5 million kilowatt-hours. And in large part that is because we have gotten creative about how we maintain conditions inside the Biosphere 2." self-sustaining with installation later this year of 470 photovoltaic panels. Instead of a thick and expensive layer of silicon, the panels use a copper indium gallium (di)selenide compound often abbreviated as CIGS. Nice to have the generator numbers for a near methane gas but will not be using that on mars. The power levels will be a bit higher as we will need the extra due to natural lighting being less and air circulation being higher for the larger area. It seems like some good gestimating. One thing I think about Mars, is it is not likely that the "Land, Seas" will be as productive as those of Earths on average, but still there is a whole lot of not used land. Figure out how to make it +/- (WhoHoo) ~10% as productive as the land of Earth, and it seems to me you have a deal closer. That is there has to be a threshold where inhabitants of Mars could make a go of it. I think it could be within reach. But a true struggle will be required to get there. While it might seem to be a bit off topic, this material is crucially dependent of having vast amounts of water as it seems is true for Mars after all. Oh, I am having a fine day. I think I figured out a better way to farm on Mars, that is bulk food farming. I am of course using other peoples work, and joining them and adding a few sprinkles of my own notions. 4) Spirulina and other micro-organisms as farm products. 5) Containerized farming under ice in a fresh water reservoir utilizing an associated heliostat. Primarily in the northern hemisphere of Mars, but not exclusively it appears that the opportunity to create ice covered reservoirs of water perhaps 100-200 feet deep exists. Unfortunately the current atmospheric conditions of Mars indicates that these will evaporate without mechanical protection. So per previous posts, a suggested method of mechanical protection has been proposed. That is a flat greenhouse that has tempered glass per RobertDyck. That glass we hope hosting solar cells that consume unwanted types of photons to produce electricity, and we hope allowing through the glass, plastic, and ice photons that plants might find useful for their needs. Recently a new member mentioned the importance of Bees in crop growth. Certainly that was true. However, I have reasoned that for Potatoes and Edible Fungi this may not be true. "The Martian" helped with that understanding, and also it is obvious that Edible Fungi are not flowering plants. Not animals either. For human comfort I prefer a reservoir of brine where stratification can allow room temperature conditions at the bottom of the reservoir (But below freezing temperatures under the ice). But for canistered agriculture of the type I am going to work towards, I think the more easily obtainable fresh water reservoirs are ideal. I am not going thermally metric. It takes too much time maybe later. Under the ice 32 degF, at the bottom of the reservoir perhaps 39 degF if you arrange that. You cannot heat the bottom water more than 39 degF or it will turn over. Containerized farming would be the method of making a container with windows to allow helpful photons in, and to pressurize it to 70 to 1000 mb air pressure. (Experiments on higher pressures effects on crops would be interesting, but pressurization increases will cost in terms of required container strengths). In this case my intention is that the container will be hosted in the reservoir, and that the photons it receives travel through the protective mechanical devices above the ice, the ice and the water. Attenuation of light can be expected. While 10% Earth normal might be acceptable, why not boost that up with a heliostat? Underwater solar powered farming robot. Previously I imagined humans in special protective suits/garments manipulating the containers. Now I think OK lets add this container to a robot. The robot will also have a single heliostat, and the container will be in it's focus. Solar cells protected from the water by whatever means, will power it. It will be able to tilt to the sun, as boyancy will eliminate many of the penalties of gravitation. Of course it has to be designed well. It will be able to rise to the sunlit surface 32 degF in the day. It will not need to, but for some crops it might drop to the bottom at night 39 degF. At that time if necessary the mirrors of it's heliostat would be cleaned. When it is planting time or harvest time, it will be able to navigate to a diving bell at the bottom of the reservoir and be taken in for the function, planting or harvesting, or prehaps repairs. Now what are the crops? Well, I am just going to go into 2 schemes. Others likely exist. I owe a debt of gratitude to "The Martian" after all. Whoever gave them the idea of potatoes was genius. I add some other things however. 1) Potatoes and Edible Fungi. Potatoes will most likely requrire the least mechanical intervention. No bees, no pruning. Fungi also I think can take care of themselves. The compatablity of the two is that the Fungi will digest organic matter, produce CO2, and also possibly provide nutrients to the potatoes, and the potatoes will provide Oxygen to the Fungi. Of course without calculation this might not work. Illumination and original materials for the fungi to decay, the growth rate of potatoes. It has to be balanced throughout the whole growth phase so that neither potatoe or fungi die. For organic matter for the fungi to digest we have sterilized (I hope) people poo (That actually suggested in "The Martian), or microbial goop from the reservoir. So, not bad, if it works Potatoes, and Edible Fungi in bulk. Potatoes can even tollerate a light frost. But our solar powered underwater farming robot will keep them in conditions of 32 to 39 degF at the lowest, and with a concentrating mirror, the day temperature can be whatever is optimal for the crops. It seems that frost will not be an issue for the potatoes. I suspect that the edible fungi will tollerate it as well. I hope so. 2) Spirulina. Containerized Spirulina may tollerate nighttime temperatures of 32 to 39 degF, but will not grow well if the daytime temperatures are not at or above room temperatures for humans. At least that is the information I have gathered from the web. But it has vast nutritional value. My readings claim that 1 gram of Spirulina is as good as 100 grams of Spinich and Carrots. 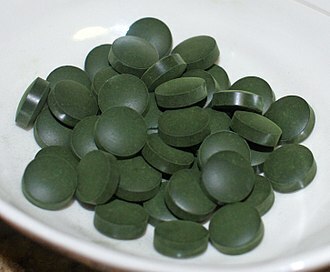 Spirulina has much protein, and B12, but the wrong B12 apparently. We need something else. 3) Something else. I belive that RobertDyck would have knowledge in this, a micro-organism that provides a B12 suitable for humans. All B12 as far as I know origninates in micro-organisms and we get it from meat for the most part or the vegans get it from supplements. So, we have to find a micro-organism to provide that to people on Mars. We can most likeliy containize farming plans 1, 2, and 3 under ice using a solar robot with a significant heliostat in a mechanically protected ice reservoir on Mars. That is my opinion at this time. We can most likely provide for bulk human nutrition by these methods. Well, I can speculate on the genetic modification of Potatoes and Edible Fungi, to suppose that their nutritional values can be expanded. We might see that. But absent of that, 3D food printing suggests that if we have potatoes, and edible fungi, and spirulina and some type of vitamin B12 generating microorganisms we have the bulk of what is needed for food survival on Mars. However a cheerful life is preferred if possible. Obviously you can have various types of potatoes and edible fungi under this scheme. But 3D printing suggests that you can make your food more interesting. More visualy and otherwise sensualy desirable. Of course that is what would be preferred. I will work on it later. It does not seem to tell me now where I screwed up on spelling. You can make it work, good enough. My English teachers bless them are already most likely under the sod. They did their best. And so Potatoes, Edible Fungi, and various types of goop. Chances seem good that it could work out for food. By the way I had a family member with the nickname of "Goop". Too bad she died from breast cancer. It's been a while. OK, I corrected some things on post #40, that were not spelling, but spoke wrongly about technological intentions. Well that is just cool I think. Lets do it on Earth. Potato and Fungi robotic underwater greenhouses all though the oceans and lakes maybe? Only problem is you have to be very careful to not get toxic fungi involved. On Mars that should not be a giant problem, but on Earth special methods would be required. Still, food, food, and more food, if it is affordable. If it is a stormy day, with bad waves, then the robot goes down below that. If it is a calm day, it presents itself toward the surface of the water. The price of food will very likely go seriously up. Peter Zeihan predicts famine in many parts of the world. Economical? Well perhaps if you don't want to starve to death. And then if this happens we get lots of information on how to do something similar on Mars. Potato and milk are an (almost) complete diet. Potatoes we can grow, but milk? Maybe taking along a culture of that bacterial milk that's being developed would be a good idea. The best, though, would be to genetically engineer yeast to turn starch into dairy products. One for cheeses, one for yoghurt, one for cream, butter etc. You can probably use Soya milk for most purposes for the early period. It will be some time before there are dairy farmers. This subject did get discussed under the life support heading. Good ideas. I guess the only reason I can justify aquatic robotic bulk farming is the apparent abundance of ground ice in many locations of Mars. That actually is quite a wild card. But with Arcadia Planetia and Utopia Planetia apparently having much water a robotic underwater bulk farming method might make sense to achieve the bulk of calories required for a population on Mars. After that things like soy or whatever could be produced as a minority source of calories, by other methods. It really excites me that it might be possible to invent this robotic undersea farming method to be practiced on Earth first. Perhaps it might even be profitable. If not, then at least interesting, and a practice for Mars. Oh, and I would like to make the point that cannistered agriculture would not have to be underwater. I believe I have suggested this before. If you had a "Tent" which protected from U.V. you could put cannistered items in it. But not only do you have to protect it from U.V. but from frost. For that then put a sufficient number of canisters of water where they will ward off frost at night. Those might as well grow some type of aquatic crop. Maybe taking along a culture of that bacterial milk that's being developed would be a good idea. Years ago, a company called Yves produced a line of vegan cheese products made from casein (milk protein) produced by microbes. Then it was discovered the company Yves bought their casein from was using microbes to isolate casein from milk. So origin was still cow's milk. "Good Slice" went out of business, although Yves continues to make veggie substitutes for meat products. So what's your "bacterial milk"? Is it real? Or is it fake like the supplier to Yves? The other issue is yeast feeds on sugar. Making vodka from potatoes requires an enzyme to break down starch into sugar. That's done by sprouting barley, then cooking sprouts in hot water, but below boiling. Each source I read gives a slightly different procedure and temperature. Basically, kill barley sprouts by drying them at 90-150°F. Malted barley is then added to mashed potatoes, starting at 140°F, hold for 20 minutes, then raise temperature to 150°F and hold for an hour. The enzyme beta amylase from malted barley will break down starch into malt sugar. Then cool to room temperature before adding yeast. A mould that grows on fruit produces gamma amylase. That enzyme requires acid, basically acidity of fruit, and different temperature. It converts starch into glucose sugar. That tastes like white sugar instead of malt, because, well, it is white sugar. That enzyme is a major ingredient in "turbo yeast", available in stores that sell products for home beer and wine making. Milk isn't particularly necessary for early Martians; indeed, the majority of the world's population is lactose intolerant, and spinach and kale are adequate sources of calcium. Oh, it is yeast after all, not bacteria - World's First Artificial Cow's Milk to Hit The Market Next Year (2014...) I don't know what happened with it. EDIT: genetically engineered yeast could potentially be used to synthesise whatever nutrients we need, which will make designing diets a lot simpler. 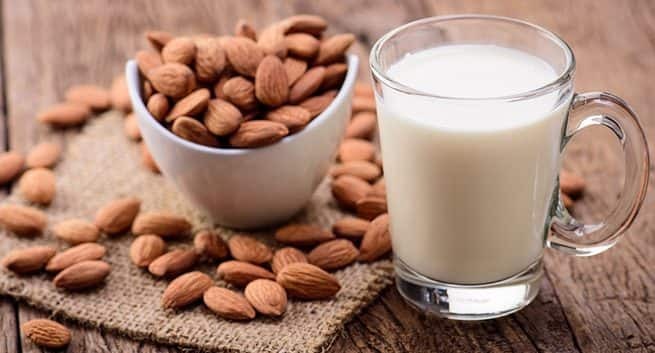 Almond milk is a plant milk manufactured from almonds with a creamy texture and nutty flavor, although other types or brands are flavored in imitation of dairy milk. It contains neither cholesterol nor lactose, and is often consumed by those who are lactose-intolerant and others who wish to avoid dairy products, including vegans. Commercial almond milk comes in sweetened, unsweetened, plain, vanilla and chocolate flavors, and is usually fortified with micronutrients.